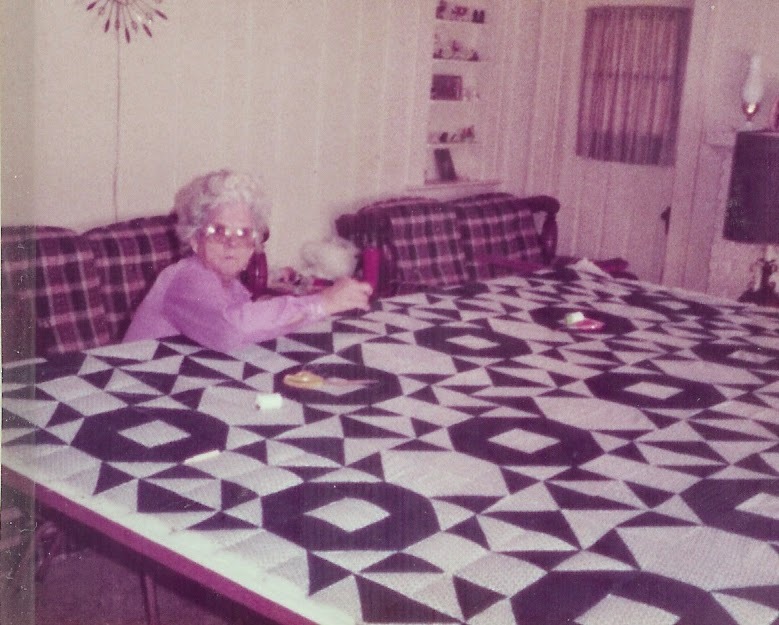 Not only was she always crafting, but she always "stuck up for the little guy". Usually that was me. I was the youngest of the grandkids and... well... I marched to a different beat. I remember one summer, there was a considerable fuss because I didn't want to go to the tackle shop and wanted to go to the sewing circle instead. It was very close to blasphemous! Since I was a boy, I wasn't allowed to attend. So, she hid me under the quilt. I remember laying there, trying not to make a sound, listening to the drone of conversation and watching hands busily at work. Eventually I was discovered and she was asked not to bring me back. I was sad that my sisters and female cousins could go and I couldn't. I didn't think it was fair. So, she took me into her sewing room (which was forbidden to children) and she taught me how to thread a needle and make some simple stitches. I think that one of the reasons that she's one of my greatest creative influences is that she was one of the first people who ever gave me permission to be myself. When everyone else had an idea of what little boys should do and be like, she let me decide and encouraged me to do what made me happy. If you're like me, after such a long winter, this time of year is breath of much needed fresh air. The sun has come out, the clouds have parted, and the land is finally coming alive again. And it truly is a beautiful thing! 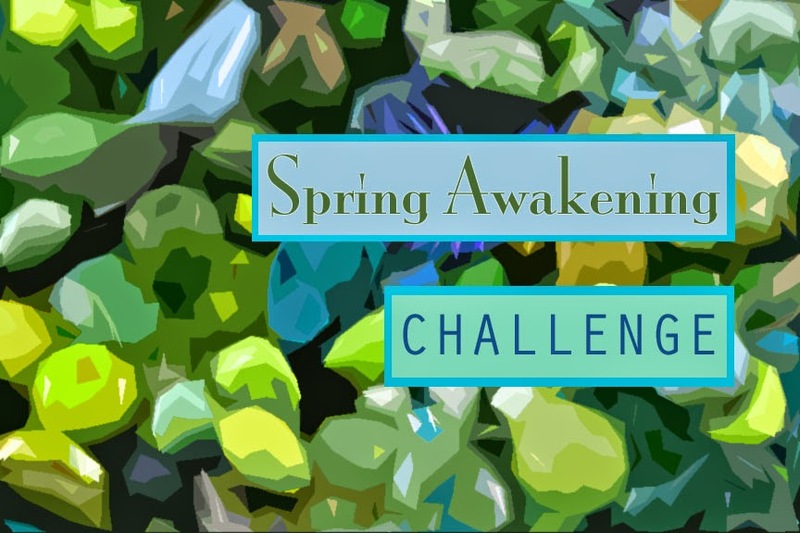 Today is the reveal for the Spring Awakening Challenge and heralds the start of the season! If you're not familiar with the challenges, I gather an assortment of components and put together a kit. The kits go out all over the world and people make things with what they receive. It's so interesting to see how different the pieces turn out! While there are a few guidelines, it's really just a fun exercise to play creatively. All of the kits are nearly identical and from there, so many choices can be made. Putting together the kits, I try to hold an image in my mind. It helps to guide my hand in selecting things. One false move and it means hours of picking beads out of a mix or restringing! For this challenge, I thought of spring and the power of the world coming back to life. Where I live, during the winter, it's pretty monochromatic and gray. (There's a little bit of brown, but with the overcast skies, everything becomes muted and a hush falls over everything.) When spring finally emerges, there's a shock of color! The snow melts, the grass starts to turn green and the blue of the sky returns. When I was growing up in Florida, I didn't fully appreciate how magical this time of year can be. Now... I fully appreciate the rising temperatures and the landscape thawing out and coming back to life. To find out more about the kit, CLICK HERE. Each of the kits include a Mystery Component! For this challenge, I included this polymer clay floral pendant in springy shades of blue and green. I made this bracelet! 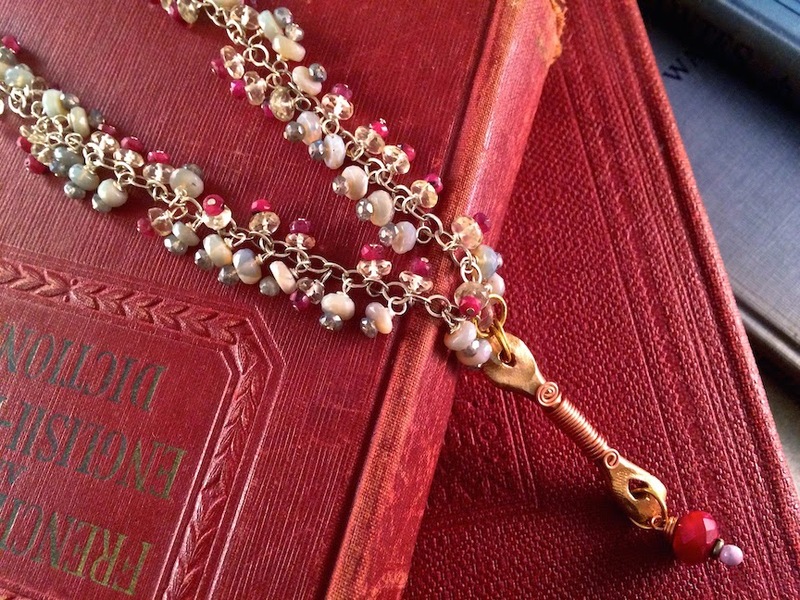 I embellished a length of chain with wire-wrapped dangles. I strung vintage Czech glass, Swarovski crystals, amazonite, and apatite onto the soldered silver chain. 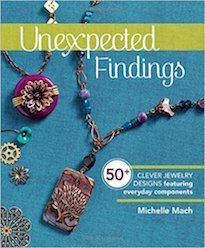 To pull it all together, I used a small flower clasp from my family at Green Girl Studios. The bracelets has a lot of movement and because of the oversized chain, the configuration of the dangles is constantly changing. It's almost as if the bracelet is alive! But wait... there's more to see! Please swing by the blogs of the other participants of the Spring Awakening Challenge! Check out what they made and make sure to leave lots of comments! Up next is the Catch Up Reveal. I'll post more information about it soon! Then it's the Frenzied Motion Challenge! The reveal is set for Thursday, April 16th 2015! Make sure to stop by and see all the wonderful creations! Up until now, the Mystery Component for the Frenzied Motion Challenge has been top secret! Only me and the participants of the challenge were in the know! Today is the Mystery Component reveal. The inspiration behind this kit was a whirl of frenetic energy and the pulsing lights of the dance floor. While the image that comes to mind is crystal clear, translating it into a jewelry component... not so easy! I played around with several variations until I settled on this abstracted interpretation. It sort of reminds me of a funkified Atomic Star motif. I think it's vibrant and fun! 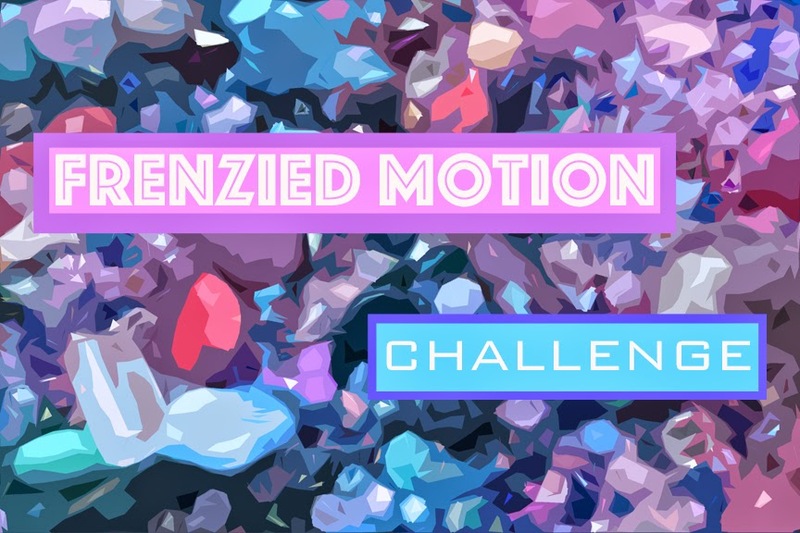 Keep your eyes peeled for the reveal of the Frenzied Motion Challenge! The blog hop is scheduled for Thursday, April 16th! AND... the reveal for the Spring Awakening Challenge is only a few days away! Join us on Thursday (March 19th) for that blog hop reveal. No, it wasn't a typo. The title of the blog post is correct! Even though it is mid-March, we are revealing the creations we made for the February selection of the Inspired by Reading Book Club, "Geek Love" by Katherine Dunn. (It slowly got pushed back due to February being a short month and bad weather.) I feel awful for postponing the in-person meet-up. (We will be combining our February and March in-person meet-up.) I usually look forward to it so much, but I've been working crazy hours and I just needed a night off to cuddle a cat and catch up on March's selection. We'll be back on track in short order! Our February book selection... was zany! This book, written in 1989, follows the life of an albino hunchbacked dwarf named Olympia and her family, the Binewskis. Like Oly, each family member is "different". The book is one of those books where you're like, "How much weirder can it get?" And then it gets weirder, and tops it with an extra helping of weird. 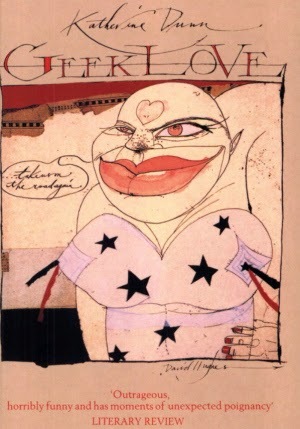 But the extreme weirdness is part of the charm of this book and I can't help but think that this was the inspiration for some of the current carnival-themed TV shows. Ahem. American Horror Story: Freak Show. Ahem. Laurel Ross made this necklace. Here's what she had to say about it: "My inspiration is twofold this month. I came up with this design from my feelings about the beginning of the book. It was relatively weird, but I thought it was narrated with fond memories and never expected things to get as twisted as they did. 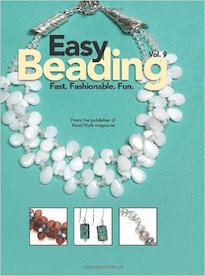 The blown glass beads featured in this design are from the Design Challenge called Festival Lights. When they came up in a destash event, I knew that I had to have them! And I'm so glad I have the perfect story to create with them. The focal is a ceramic piece by Andrew. 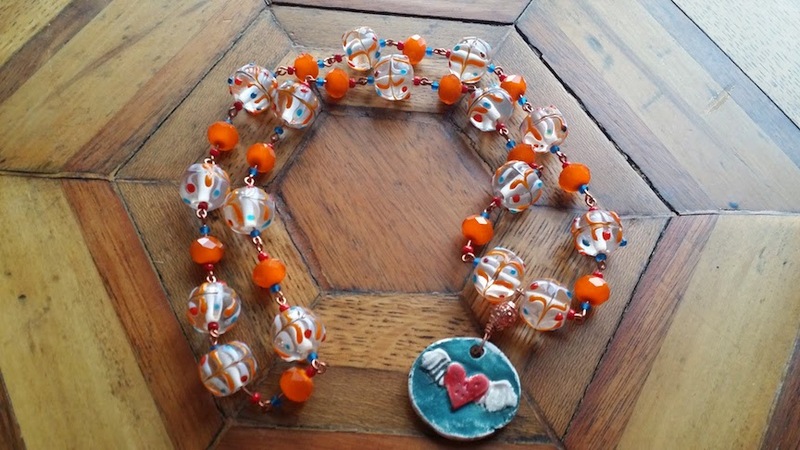 It doesn't quite match the mostly primary colors of the beads, but I like the contrast and I wanted it to represent the happy feelings a person gets when they go to a carnival – the lights and sounds and intrigue." Laurel also made this necklace. Here's what she had to say about it: "With this piece, I'm showing how the book turned from happy and heartfelt, to black and deranged and how it went "up in flames". Spoiler alert: When Chick reduced the circus to rubble with his fireball, I was so saddened and also very disturbed! I got the focal from a destash a few years ago. It was the perfect way to show the carnage from the fire. I used part of a triangle toggle as a closure and funny enough, a piece of it broke apart while I was attaching it to my necklace – broken apart like that crazy family! And so, it became a component to represent the love triangle which can be made between many of he characters." "Lastly, there is a small black heart. It's wire-wrapped on a green enameled headpin. This represents Aqua Boy and his black heart and green, worm body. I'm utterly disgusted by him. All in all, this book was certainly crazy! I really can't wait to see what images everyone else is putting into their pieces." I made this piece. I took a more literal approach. 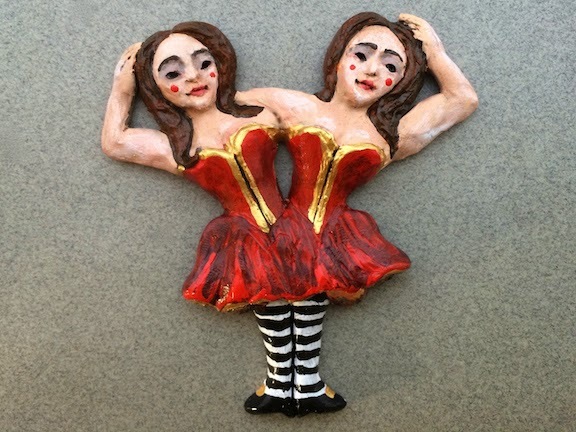 The piece I made is crafted out of polymer clay and depicts the Siamese twins, Iphy and Elly. 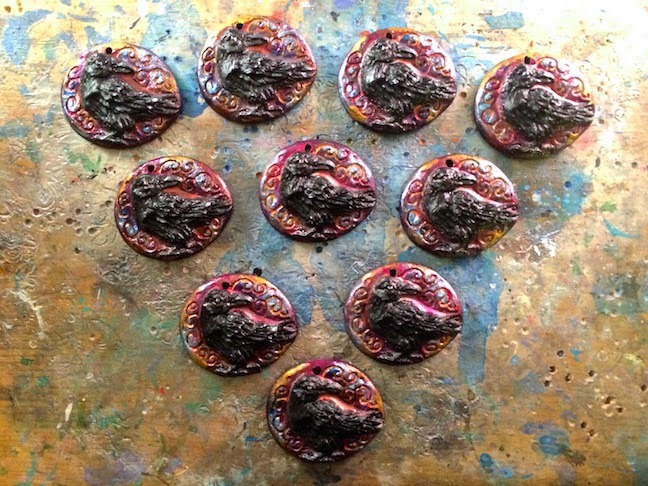 I had the idea to sculpt all of the Binewski clan and turn them into pins to be attached to a sash. But time has been short and I only got The Twins done. I will say that this book was very visual and there were plenty of things to find inspiration in. 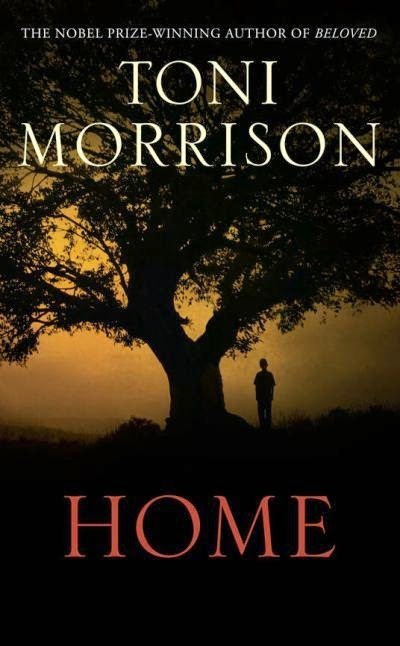 Up next is "Home" by Toni Morrison. CLICK HERE for the full list of this year's books. There's only four more books in this cycle and then we'll begin the next series of selections. CLICK HERE to see the next assortment of books. The in-person meet-up for Home (and Geek Love) is scheduled for Wednesday, April 1st. The blog hop is scheduled for Thursday, April 2nd. If you're interested in keeping up with us and what we're doing, CLICK HERE to visit our Facebook page. CLICK HERE to check out our supplemental inspiration on Pinterest. I'm not super familiar with SuperDuo beads. I've played around them once or twice before... actually I think both times were during the last few Fusion Beads 30 Day Bead Challenges! So, they're still pretty new to me and required more time for me to play with them. This time, I decided to make a ring. I used Chalk White Gold Luster (the coral colored ones) with Opaque Champagne Luster SuperDuo beads and gold-plated size 8s. The gold brings out the lusters in the other beads. I think it turned out pretty! It reminds me of a Pennsylvania Dutch Hex symbol that they paint on the side of brains. The ring isn't perfect, but I've learned a lot about working with these beads and I'll be ready for next time! Day 10 marks being a third of the way through. There are a lot of really great challenges on the horizon. So take a moment to check out the calendar! You might see something you might like to try out! Let me introduce you to the latest Design Kit Challenge: Sweet Honey! If you're not familiar with the challenges, they are a fun way to push yourself creatively and create from an assortment of pre-selected components. To participate, you must purchase a Design Kit. This kit features a glittering array of Czech glass (both old and new), vintage German glass, vintage brass stampings, vintage seed beads, waxed Irish linen, and a Luxury Bead Blend. The Luxury Bead Blend consists of a whole lotta pretty! It is made up of Japanese Miyuki seed beads, Toho seed beads, Japanese Matsuno seed beads, vintage Venetian seed beads, vintage French seed beads, freshwater pearls, vintage Czech glass, new Czech glass, vintage sequins, jade, stone, base metal, quartz, citrine, Swarovski crystals, amber, marble, red aventurine, Japanese glass, vintage lucite, agate, tiger's eye, glass pearls and MORE! But that's not it! Each kit includes a special, handmade Mystery Component! The component is a secret until it arrives at your door! The Mystery Component will publicly be revealed on Monday, April 20th 2015! I was digging through some boxes and found a tray of amber. The warm gold and topaz colors reminded me of honey. I've secretly wanted to keep bees for the longest time. I don't know how good I would be at it considering that I'm somewhat neglectful of living things, but it has been a fantasy of mine! Not only do I love the rich, heady sweetness of honey, but I love the smell of beeswax. This kit is an ode to that apiary dream. With your kit, using as much or as little of it as you like, create a piece that showcases your creativity, individuality, and artistic expression. Ideally your creation will spotlight the fantastic assortment of beads included in the kit, but the sky is the limit with what you can make! Feel free to use beads from your own stash to augment the offered selection. Whether you use a little or a lot of your kit, make sure to keep your project a secret until the reveal date! The reveal date is set for Thursday, May 14th 2015! Post a picture on your blog or send one to me to post on your behalf (if you don't have a blog of your own). 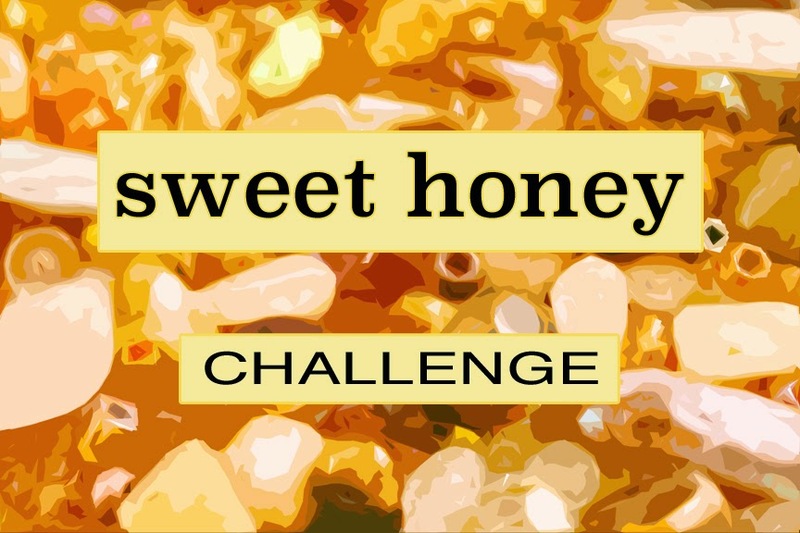 The Sweet Honey Challenge will end in a blog hop, sharing all the lovely things made with your kit with your fellow participants. With that being said... we hope you have a fabulous time and a ton of fun making things! We can't wait to see what you make! 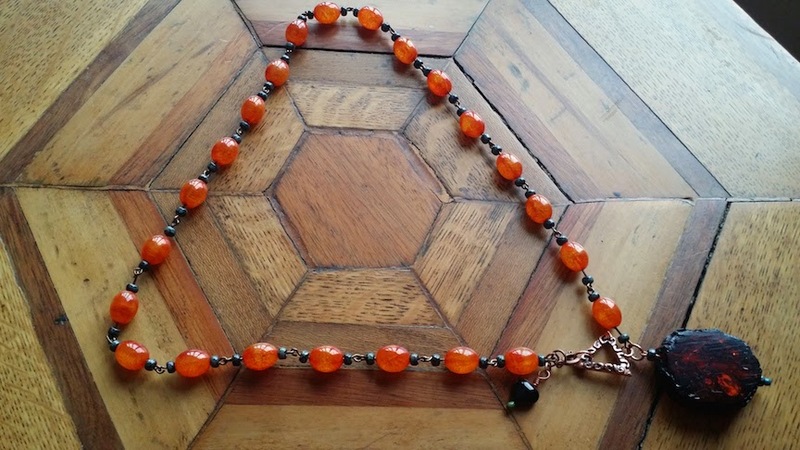 After my Day 6 creation that was inspired by the long necklaces of Lady Mary of Downton Abbey, I sort of feel a little deja vu! The prompt for Day 9 was to "make a sweeping style statement and create a lovely long necklace". For my piece, I broke out the vintage Czech glass in a purply amethyst, coral beads in a vibrant red, and gold-plated Japanese glass. I thought about keeping it one continuous strand of beads, but I thought I'd add a little design feature and use a bronze filigree bird from Nina Designs. The bird can be worn in the front, off to the side, or even in the back. (Don't forget to mention me if you place an order with them!) The necklace that I created is long enough that it can be worn once around or doubled up for a fuller, layered look. I like the mix of gold, purple, and red. It looks very regal to me! This was but one day out of a month of challenges! There's still a lot of great ways to test your creativity and play along! 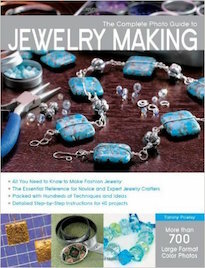 Celebrate National Craft Month by making something! I'll be honest. I'm not the most tidy of people. My brain seems to function better in chaos and a little clutter doesn't bother me. But it's that time of year and time for a spring cleaning! Luckily the prompt for Day 8 aligned with urge to get things more in order. 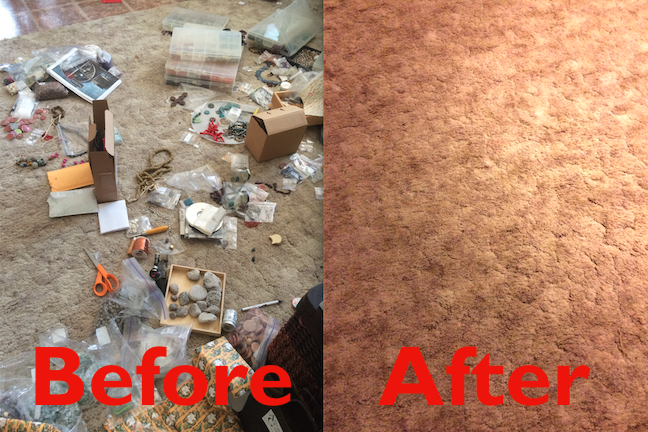 Here's a before and after snapshot of the living room floor. I'm pleased with how much I got cleared out and put away. And this wasn't the only area that I tackled. I also started on the back room at the shop and a little in my studio. I found it helpful to keep a notebook with me while I'm cleaning. I've been reintroduced with a lot of things that I forgot about and the process of putting things away has sparked a lot of ideas. Sure, it takes longer to sit down and take notes or draw a picture when something comes to mind, but those ideas are like gold. The 30 Day Bead Challenge hosted by Fusion Beads is in full swing and there's still plenty of time to play along. You can start where ever you like! There's an entire month of prompts to pick from! The prompt for Day 7 was to go "wild for wire". One of my default techniques is to embellish a chain by adding on a thick fringe of wire-wrapped dangles. I started doing that for this challenge. I went totally top shelf for this piece. I busted out the rubies, opals, tiny faceted labradorite, and Oregon sunstone rondelles. I strung up the headpins and wired them on to the individual links in the chain. For the focal, I dug out a "bone" connector that I made out of BronzClay. Originally I had a handful of them linked together to form a chain, but it was heavy and looked a little Mr. T to me. So I broke up the chain and started using the components separately. This "bone" makes up the focal. I coiled copper wire around it to give it a little more visual interest and added a wire-wrapped dangle to the bottom with an enameled headpin and a ruby-colored, leaded glass crystal bead. I quite like it! 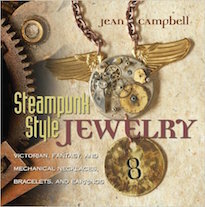 I particularly like the mixed metals, a shiny mix of silver, gold, and copper! Are you celebrating National Craft Month? If so, how are you celebrating? Are you participating in the Fusion Beads 30 Day Bead Challenge? If you're like me, the challenge for Day 6 wasn't a far stretch. We were asked to create something inspired by a TV show or a movie. Whenever I'm watching a show, I try to take in as much visual stimulus as possible and make mental notes of interesting patterns, shapes, and colors. Later, when I'm working, I conjure up pleasing details, edit those ideas and play with interesting kernels of inspiration. 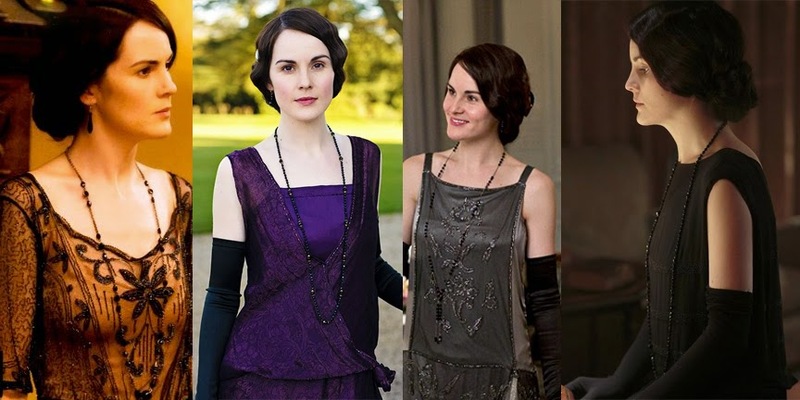 For this challenge, I turned to Lady Mary of PBS's Downton Abbey. Even though she is very fashionable and always wearing what's in vogue at the time, she's a reserved character that has dealt with a deep loss of love. This is translated into her wardrobe with clean lines and the usage of black. For my piece, I kept the minimal lines of her long flapper style jewelry. If you look closely at her jewelry on the show, there's fine repetition of pattern in the strung beads. I created a repeating pattern as well. I also used black vintage glass rounds, jet colored Swarokski crystals, and black glass pearls. My interpretation is a long necklace, but much shorter than the ones she wears on the show. It's perfect for layering and provides a nice neutral base to work off of. I could totally see Lady Mary wearing this! If you get a chance to create something for the challenge, let me know! I'd love to see what you've made! One of the fun bits of the challenges is to see how others have addressed the same design challenges. For Day 5 of the Fusion Beads 30 Day Bead Challenge, we were asked to capture colorful beads in a wrapped cord bracelet. While I had good intentions of creating a lengthy multi-wrap bracelet, after a few rows, I opted for a speedier, once around version. In the bracelet, I used a size 8/o seed bead mix that I made in pale purples, pinks, and golds. The colors remind me of breezy, Pre-Raphaelite paintings of winged angels. I paired the mix with a lavender-colored leather and used a fine pewter tree button from my family at Green Girl Studios to close it up. There's still plenty of time to join in on the fun to celebrate National Craft Month. And remember, you don't have to do every day and you can back track. I think these challenges are a great way to kickstart your creativity and get your mojo flowing! 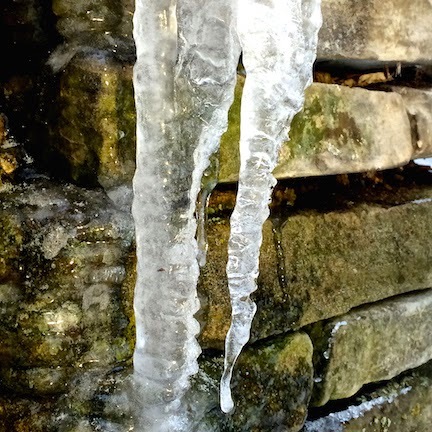 The steady tap-tap of melting ice, dripping rhythmic code, announces the end of winter. Persistent thrum, a quiet beat, a message – maybe true, maybe false: "Spring draws closer, ever-near." 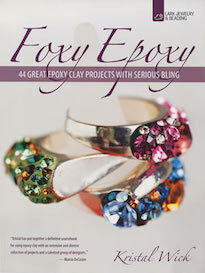 "Be captivating in crystal and get inspired by your favorite Swarovski color or effect!" That was the prompt for Day Four of the month-long creative challenge hosted by Fusion Beads. While I have a lot of favorite colors, I decided to rewind to 2013 and bust out the (then) Pantone Color of the Year. I got my emerald Swarovski crystals out and stitched together this pair of earrings using the tiny 2mm faceted round crystals and 4mm bicones. I also used a larger Palace Green Opal bicone strung on a headpin to connect to the earwires. The challenge has just started, so there's plenty of time to play along! I try to participate every year and always have fun making things. Even though you can pick and choose what prompts you want to tackle, I like to do the entire month. It's not always easy, but that's part of the magic of this bead challenge. The tight timeline is like a beady pressure cooker and it forces you to get those creative juices really flowing nice and good. CLICK HERE to check out the calendar for the entire month. On Sunday, the weather was so bad that I stayed home. I took advantage of the snow day to carve the master, mold it, and pour a few copies. Then I spent the next few days painting the pieces. Here's a better picture. I tried to get a "faux raku" finish in the background. I think it helps make the raven POP! It was tricky getting the birds just right. Ravens are actually quite colorful; the black feathers, like an oil slick, can have an iridescent sheen of purples, greens, and blues. I tried to do this the first few layers, but they looked like disco birds. So, I went with glossy black, but all the detail sort of disappeared. So, I ended up doing a flat black with touches of charcoal gray and the most subtle tiny hints of iridescent color. 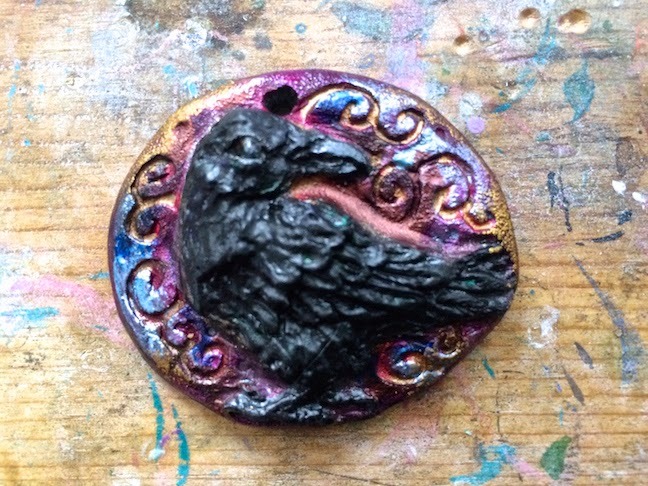 This is the master for a bird girl/harpy pendant. I didn't really set out to make one. I was doing paperwork and there was a hunk of clay next to me and the next thing I knew, this little creature emerged. Harpies get a bad rap. It's interesting to see how a symbol of beauty, spirit and freedom was transformed into a Greek monster. But that's not surprising. The patriarchal society was infamous for adopting figures (particularly female figures) from other cultures and demonizing them. The sphinx is another example of a creature that underwent a smear campaign. At one point they represented wisdom and sovereignty. The next thing you know, they are puzzle-fixated monsters that'll eat you if you answer incorrectly! 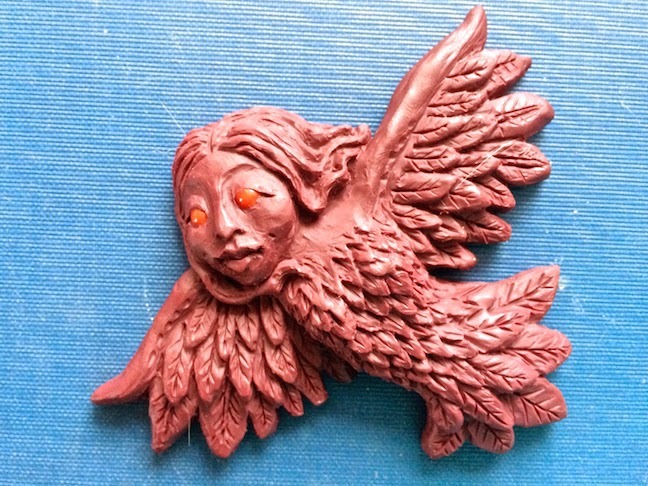 In any event, over the next few days, I'll mold the harpy master and do some resin pours. I'm looking forward to painting them and playing with different color combinations. For Day Three of the Fusion Beads 30 Day Bead Challenge, we were asked to create something out of gemstones. 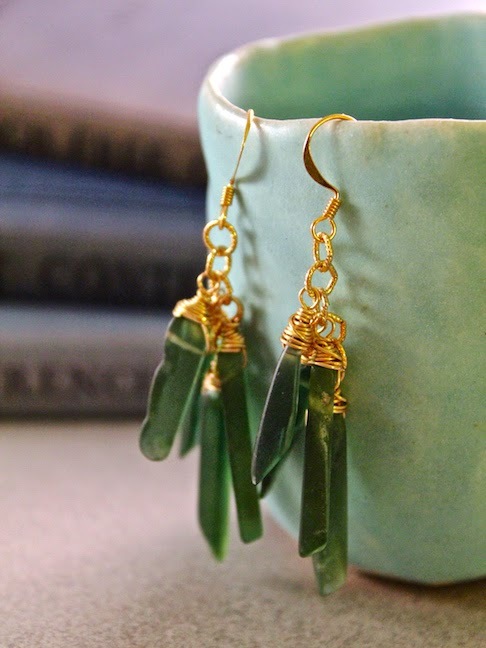 I dug around my stash and found these top-drilled serpentine points and decided to make a really fun, fringy pair of earrings. I used bronze wire to create nice, chunky wire-wraps. I think it gives the pieces character. The dangles embellish lengths of gold-plated chain. I think the gold and green works well together! Want to find out more about the Fusion Beads 30 Day Bead Challenge? They've posted the entire calendar for the month of March. CLICK HERE to take a look. 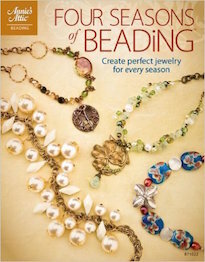 For today's challenge, we were asked to make something with our favorite seed bead mix or create a new one. I decided to make something with a mix of size 8/o hex-cut Japanese seed beads. I love the way they lock together and make peyote stitch so easy! I blended together three different colors: olive, sea foam, and antique bronze. Each color has a metallic AB finish, which helps the mix coalesce. I used this mix to create a simple peyote stitch bracelet with an antiqued copper tube clasp. 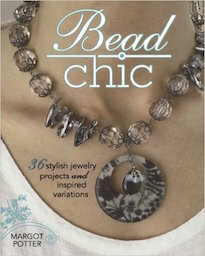 Interested in participating in the Fusion Beads 30 Day Bead Challenge? CLICK HERE to see the entire calendar and see more details. 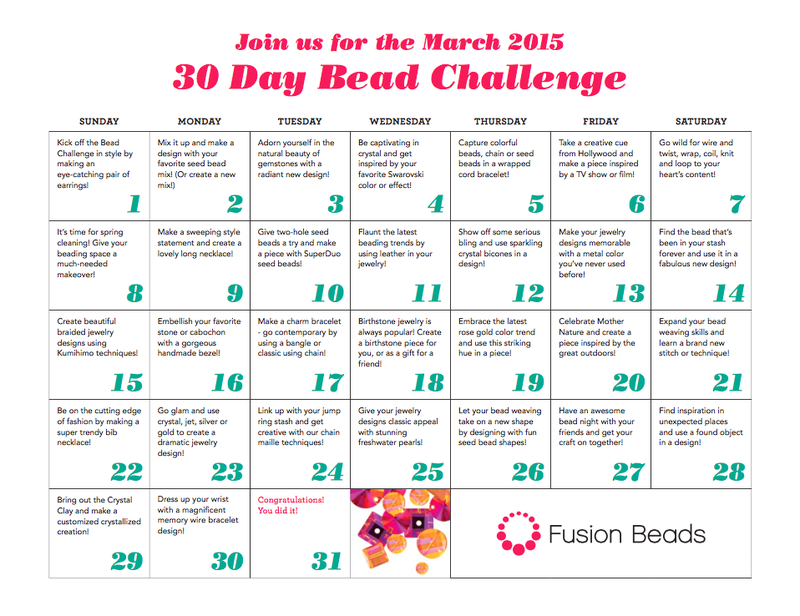 It's the first day of March, which also means that it's the first day of the 2015 Fusion Beads 30 Day Bead Challenge! Each year, they celebrate National Craft Month with a week long of crafty prompts. Even though I am super busy, I always enjoy this creative challenge. It really forces me to be strategic about time management and lights a fire under me to consistently create (and post about what I've made). To view the entire calendar, CLICK HERE. To kick things off, the first challenge was to create a pair of earrings. I wanted to make something fun and flirty, so I opted for chain embellished with wire-wrapped links strung up with Swarovski crystals. They have a nice movement and since they are hung from the almond-shaped earwires, they are even more eye-catching! I hope you'll join me in this creative challenge and play along! It's always fun and you can participate as much (or as little) as your creative heart desires. Check out what Ema has been up to in her Inside the Studio post this week! You also have a chance to win a pair of her handmade metal matchsticks! Erin Prais-Hintz hosts a creative challenge through Halcraft called, Pretty Palettes. This month, Andrew was the Pretty Palettes Partner. Stop by and see what he made! Sharing supplies with friends is always a thrill when you organize a blog hop. This one was excellent as it featured beaded rings. 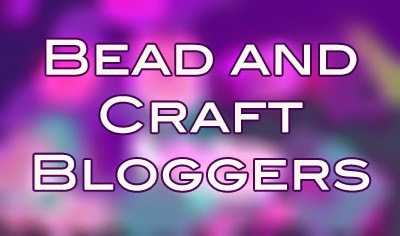 In the latest video podcast, the Crafty Princess shows off some finished knitting, crochet, and shares some bead-weaving ideas. Anyone who handcrafts gifts and decorations for holidays or other special occasions needs to plan ahead. Handcrafted things take time. Download Eileen's free spreadsheet. Connie added a new free cross stitch pattern this week. Also, check out the new additions to the Etsy shop. 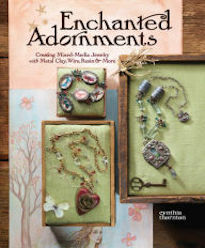 Cyndi shares how to construct a 3-D crescent form, perfect for embellishing!